West Hollywood Sheriffs deputies were on the scene at the Key Club on the Sunset Strip dealing with a large crowd that became unruly after a fight broke out during a concert. The level of disorder reached a point that the Sheriff asked other clubs on the Strip to clear out their customers. The initial fight may have been between a patron and club security, but after the club was closed and a large crowd spilled on to the street, they turned on deputies and began throwing rocks and bottles. A Sunset Strip Business District security guard took a bottle to the head. It is unclear as to who made the call to shut down the venue. A report in the Los Angeles Times says quoting law enforcement sources said that it was the club that decided to close due to the unruly patrons. Many patrons of the club reported that they were under the impression it was closed by the Sheriff. Officers and deputies from the Beverly Hills Police Department, LAPD, and surrounding Sheriff’s areas such as Universal City and South Los Angeles were sent rushing to the scene with lights and sirens blaring to assist. Sunset Blvd. was closed between Doheny and San Vicente. The incident started to unfold at about 10:30pm. It escalated about 45 minutes later with the rocks and bottles being thrown, prompting a call for additional units from surrounding areas to come in. 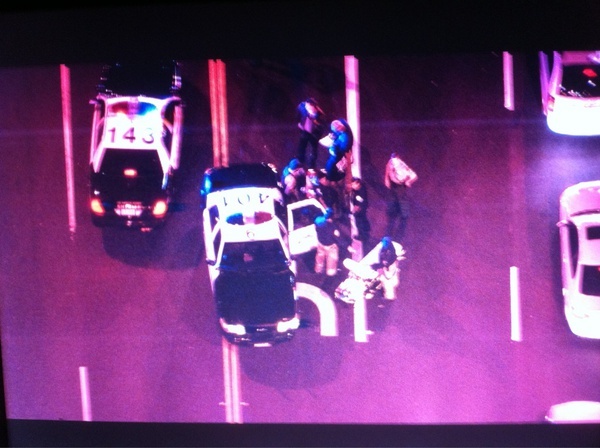 There was talk of some arrests for battery on a police officer at about 12:20AM. By about 12:35AM, a skirmish line of dozens of police and sheriff personnel spanning the width of Sunset Blvd made their way down the street to clear people. At about 1AM, deputies had several people detained against a fence for possible arrest. Our friends at Total Traffic LA have more photos from the ground. According to CBS2, one person was hospitalized from injuries from the fight, and six people were taken into the custody by 2AM. Of those arrested, three were taken into custody from the fight and three from the rock and bottle throwing. UPDATE: According to the Los Angeles Times, only two people were arrested as a result of the initial fight with the club security. They were identified as Robert James Bezeeley, 20, and Gabriel Jesse Ruiz, 19. “Due to the distance of suspects throwing rocks and bottles at deputies, it was not tactfully safe to send a team to arrest these individuals,” said the Sheriff in a statement reported by the Times. Key Club would like to sincerely apologize to the city of West Hollywood & our incredibly loyal fan-base for the unfortunate events that occurred last night. We work hard every day to provide a safe & enjoyable concert experience for all of our patrons. We hope that you will continue to trust & support us in the future!